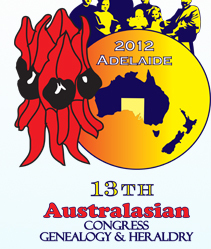 The AFFHO Congress 2012 is coming! Only 58 sleeps to go before it starts in Adelaide in March. This conference is held every three years. It will be a fantastic conference with a wide range of speakers: Colleen Fitzpatrick (USA) better known as the Forensic Genealogist and who has a neat entry in Wikipedia of various cases and her website Forensic Genealogy , Chris Watts (UK) author of a number of books on army and seamen and who does some great podcasts with National Archives, with lots more on army and navy, Roger Kershaw (UK) Head of Military, Maritime, Transport and Family History at the UK National Archives, Shauna Hicks, Kerry Farmer, Noeline Kyle and many more. Check out the website for the speakers! The topics are wide-ranging and exciting: Apprentices, Seamen, Army Records, Forensic Genealogy, Handwriting, Genealogy Programs, Scottish research, Marriage Contracts, One Name Studies, Transported Criminals, Tax Records, State Wards, Irish Orphans and more. There are topics for all levels of research experience. As well as all the speakers and topics there will be a vibrant exhibition hall for which I have been saving my pennies! Don’t forget to check out the range of exhibitors. FindMyPast is a major sponsor. Inside History, FamilySearch, Ancestry, Gould Genealogy, Heritage Family Tree, Proformat and others will all be available to answer questions. As well as all of this, I will also be meeting up with some very special people as I am planning to attend at least three get-togethers: Geneabloggers, Guild of One Names Studies (Thursday 6pm) and Genealogists for Families. I am going down a couple of days early as I want to visit the Migration Museum and also do some sightseeing in and around beautiful Adelaide. There is so much to do and see that I wish I could stay longer. A great conference, wine, fine food and Haigh’s chocolates!!!! What more could anyone ask? Registrations are still open. You can register for the full conference or just for a day so why not come along and join us?